There’s this horrible gap between my temporary teeth and my gum line, which you can see when I smile wide. At least three people fainted from the sight of it on my way home. One child burst into tears. And this dog barked and barked and barked. I think he was trying to warn everyone. It won’t be fixed for another week and a half, so if you see me, cross to the other side of the street. I can still sing, however. I may look like a monster, but my voice is unchanged. 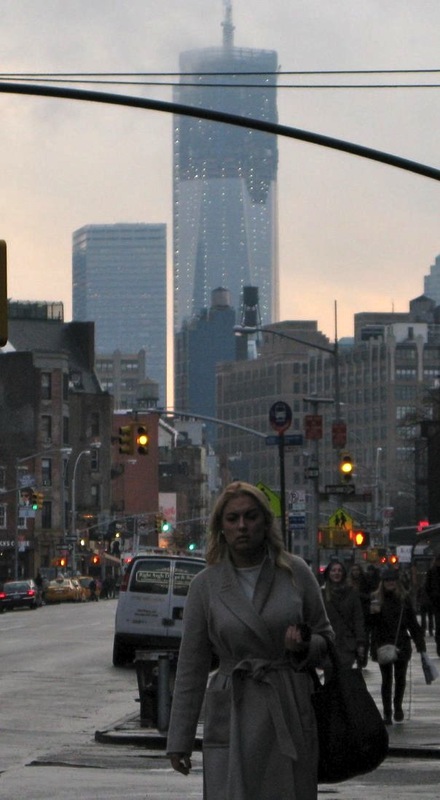 One World Trade Center, rising up and up. This picture accurately captures my mood for the past two days. Dreary. Hopeless. Mostly about my book. I just can’t get it to where I want it to be. But I met with my agent and now I feel ready to try again. For the billionth time. Hope has returned. Thank you, Betsy. Thank goodness you’re not posting any pictures of your hideousness! LOL. Hang in there! I know it probably feels very obvious and unpleasant. But you’re gorgeous–inside and out. Try not to let it get to you. And think how nice it will be someday to hopefully have fewer teeth problems because you are taking care of them now. I salute you. Thank you. It does look pretty bad, but nonetheless I’m feeling overall good and relieved that I finally bit the bullet and started the process.